Gay love blooms in northern Italy. A Mexican boy ventures into the afterworld. 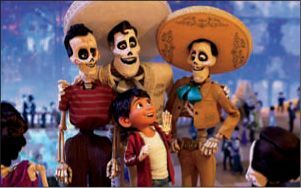 The latest animated hit from Pixar offers such an exuberant vision of Mexico and its traditions that it “feels as if you’re sticking your head inside the collective unconscious of an entire culture,” said Ty Burr in The Boston Globe. The story follows a Mexican boy who’s magically transported to the Land of the Dead during his village’s annual Dia de los Muertos celebration. To escape, he needs to locate his great-great-grandfather, but in the meantime, he’s surrounded by music, riotous color, and friendly skeletons, as Pixar’s in-house geniuses once again “force a fusion of the marketplace and the metaphysical that is unique in pop culture.” The busy screenplay “throws a lot at the wall to see what sticks,” said Michael Phillips in the Chicago Tribune. The protagonist, Miguel, learns plenty of life lessons as he defies his family to pursue his dream of playing music—and even solves a murder mystery along the way. Still, the story eventually arrives at a heartwarming climax. 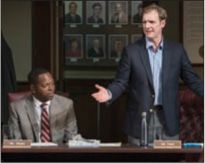 Besides, its message about love’s enduring power “couldn’t be more timeless,” said Alan Scherstuhl in VillageVoice.com. During the powerful finale, “I cried, but warmly”—over affection and memories that endure across generations. A fifth-grader learns to accept his unusual face.